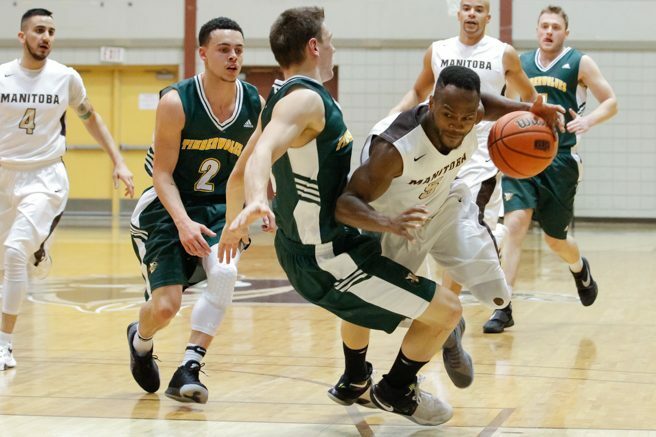 The University of Manitoba men’s basketball team was on the road in Brandon this weekend, where they saw their eight-game win streak come to a screeching halt. They fell 79-68 to the Bobcats on Friday night; Brandon picked up where they left off and defeated the Bisons 92-77 on Saturday night. With the two losses, Manitoba is now 10-8 with just two games remaining in their regular season schedule. The Bisons’ shooting woes were a big factor in their 79-68 loss Friday night, a night where the ball found the twine just 29.5 per cent of the time. The visiting Bisons got on the board first with a three-pointer by AJ Basi, and they maintained the lead for the majority of the opening frame. The teams exchanged points for the most part, with Brandon tying the game a couple of times, before taking the lead on the last basket of the quarter. The Bobcats led 18-17 after the first. Manitoba fell apart in the second quarter, with Brandon opening on a 16-0 run to take a 34-17 lead. With just under four minutes remaining in the half, Ilarion Bonhomme got a jumper to fall, and finally got the herd on the board. The teams remained competitive for the final few minutes of the half, with the Bobcats taking a 42-28 lead into halftime. The play in the third was boomeranging from end to end, preventing the teams from changing the scoreboard much. Brandon still had the lead after three quarters of play, leading 62-50. Keith Omoerah netted five points for the Bisons in the third, and finished the game with a double-double of 13 points and 11 rebounds. Manitoba needed to come out with a fire lit under them in the fourth quarter to have a chance, and that is exactly what they did. After Brandon hit a three-pointer to lead 65-52, the Bisons went on a 10-0 run to cut the lead to just three points with six minutes left to play. The Bobcats however, fired right back with a 10-0 run of their own, and wouldn’t let the Bisons get any closer. Bonhomme had eight points in the second half, and finished with a Bison-high 14, while Tyvon Cooper led the home side, scoring a game-high 21 points. Brandon completed the weekend series sweep with a 92-77 win over Manitoba, a game where they dominated the paint area, scoring 54 points compared to the Bisons’ 32. The Bobcats got out to an early 10-2 lead in the first quarter, but the Bisons answered back with a 10-2 run of their own to tie the game at 12. The Bobcats took a slim 17-15 lead into the second frame. The teams were back-and-forth early on, with Brandon taking a 25-20 lead midway through the second quarter. The Bobcats pulled away, as they went on an 8-0 run to take a 33-20 lead. The game went back to being tightly played, and Basi sank the final five points of the frame, shrinking the lead to 10 points at the half. Brandon went on another 8-0 run early in the third to extend their lead to 16 points, and built a lead as large as 20 points. After being held to 15 points in each of the previous three quarters, the Bisons offense came alive in the fourth, but Brandon kept up with them. Justus Alleyn scored 11 of his team-high 26 points in the fourth, but Earl Thompson Jr. also scored 11 of his game-high 27 points in the fourth to help give the Bobcats the win. Manitoba returns home on Feb. 10-11, where they will host the Mount Royal Cougars at the Investors Group Athletic Centre to finish off their regular season schedule.